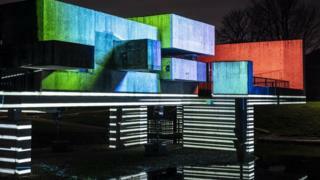 A piece of Brutalist architecture which has divided opinion since it was built in 1969 has been illuminated for its 50th birthday. Victor Pasmore's Apollo Pavilion, in Peterlee, County Durham, was awarded Grade II*-listed status by English Heritage in 2016. However, it has variously been described as a work of modernist genius and a graffiti-covered carbuncle. Its anniversary is being marked by a light and video installation. The event, by the team behind Durham City's Lumiere Festival, started on Friday and continues later. Berlin-based duo Mader Wiermann created the artwork to reflect the Apollo moon landings - which was what the pavilion was named for. It also reflects the Bauhaus style and Pasmore's own abstract paintings. Durham County Council commissioned the event as part of a year-long programme celebrating the pavilion's anniversary.